I am so excited to be finished with this August Prairie Schooler.. I put the last stitches in this morning and ran down the basement to finish it up! 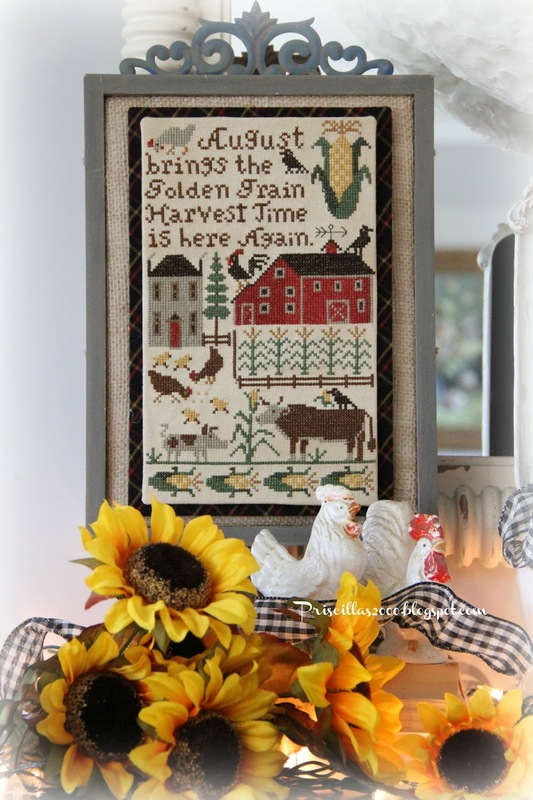 It seems like summer has just flown by .. soon it will be time for Fall! I didn't like the horse that was charted on the pattern so I stitched the pig that was on the smaller chart and added a couple more chicks..I used a black plaid homespun on the bias for the backing.. it has gold and yellow checks so it is perfect.. 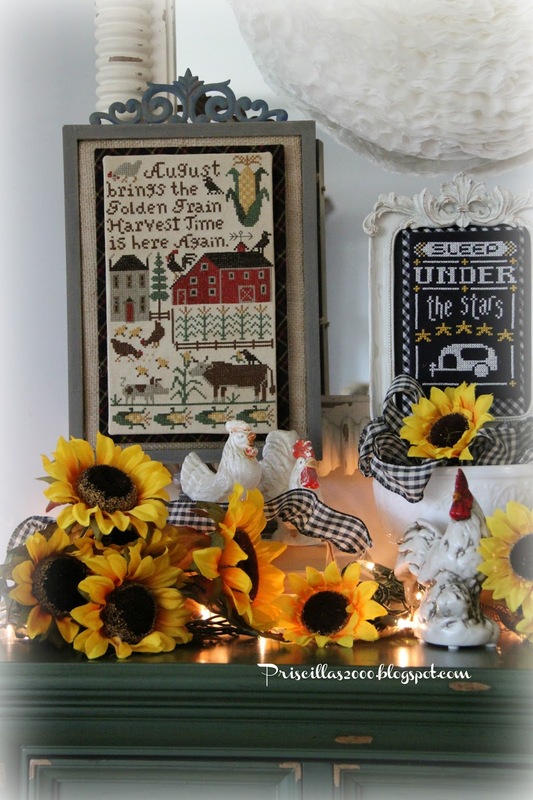 The pedestal frame is from Michael's and I added burlap to the back of it with magnets on top ..and I use small pieces of sheet metal on the back of my stitching to change it out with the months..
Don't you just love the chickens and the corn? 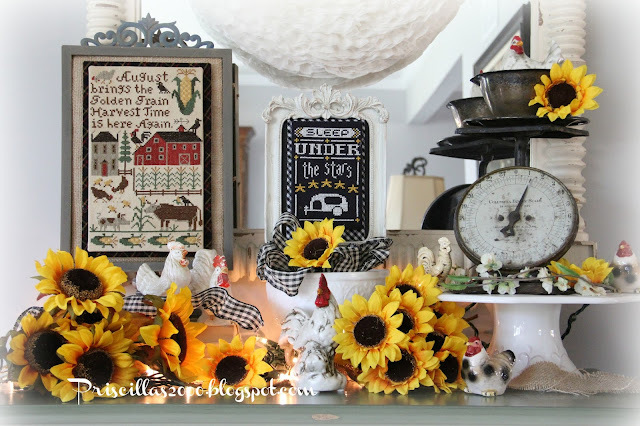 I have it on the cabinet in the foyer with the August A Year In Chalk from Hands on Design..some vintage chickens ..vintage scale and lots of sunflowers! This is the last month I am doing until December.. I didn't really like the next 3 months ..so I might try to find something else to stitch that will fit the frame ..but then I will start back up with December and I still have January and February to do.. 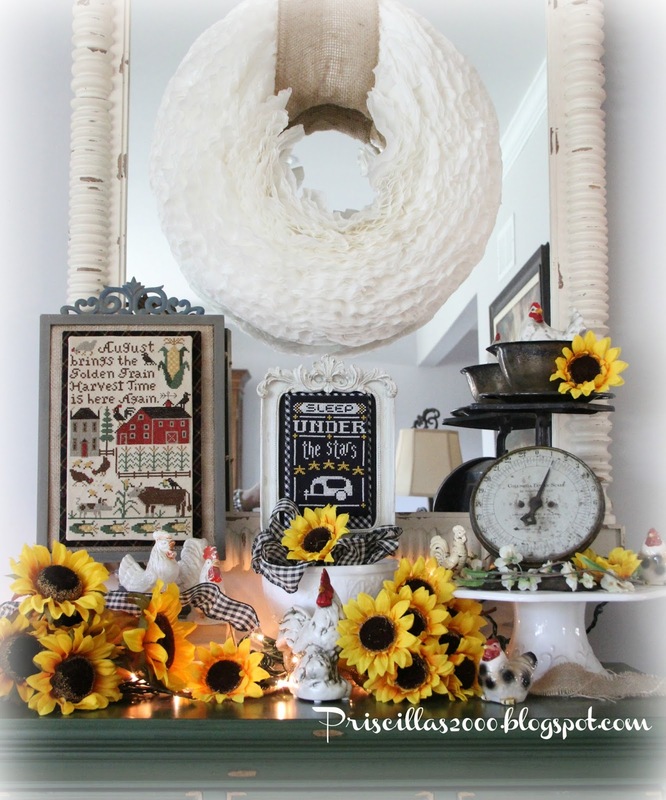 Thanks s mouch for all your visits and sweet comments !Linking to these fabulous parties ! Priscilla that is just darling!! I still have my July up because I really loved it but I have August on my to-do list as well. Good idea about switching out the horse - your pig is adorable!! Chickens, cows, and corn, cute August farm stitchery. It's lovely! You've made such a pretty 'August Central' for your home. Very pretty. I love the displays. Your photo's are gorgeous. 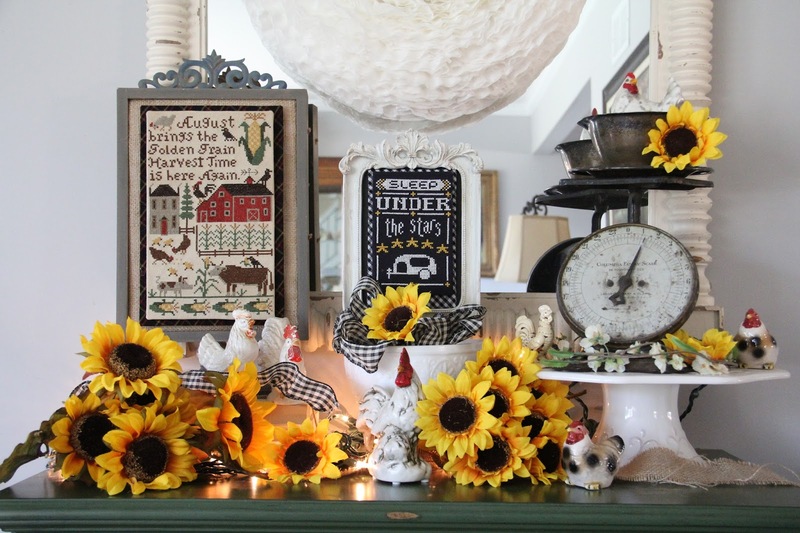 You piece is adorable love the corn, the vignette setting with the sunflowers is so pretty.